Phosphuranylite: Mineral information, data and localities. 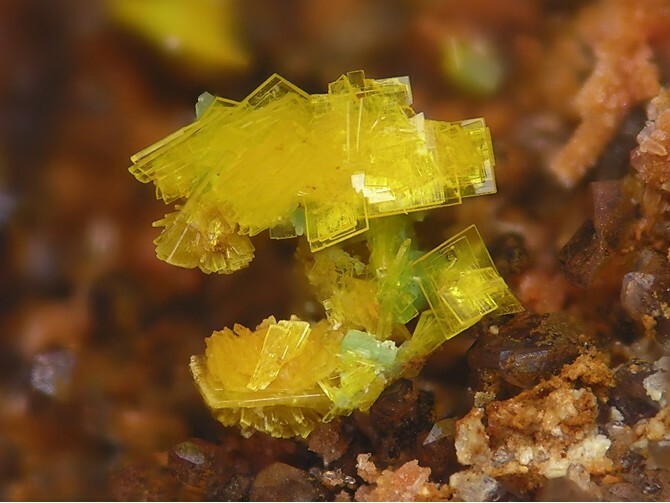 Named in 1879 by Frederick A. Genth in allusion to the chemical composition, being a PHOSPHate of URANYL uranium. Small crystals may have thin rectangular bladed habit. See also the closely related yingjiangite and dewindtite. NOTE: Modern analytical techniques applied to specimens of "phosphuranylite" in the Joseph Cilen [1916-1997] collection, Hawthorne, NJ, USA, accumulated over a period of 50 years, and containing many older specimens, identified yingjiangite in many instances (Chet Lemanski). A secondary mineral commonly occurring in weathered zones of granite pegmatites, coating fissures near altered uraninite, and in paleochannel deposits in sandstone. Frequently present in an alteration halo around uraninite/pitchblende found in granite pegmatites. The uraninite may have in contact one of more various schoepite group minerals. Dark yellow phosphuranylite may be found as a coating on a fracture around black uraninite at several to many diameters of the core uraninite grains. Autunite group minerals are in an outer ring that may overlap with the phosphuranylite. The refractive index of reported phosphuranylite is unreasonably large, suggesting poor identification control. Occurs as thin scales with an irregular to rectangular outline. The scales form scaly crusts, thin films and coatings. Also powdery. Metatorbernite 18 photos of Phosphuranylite associated with Metatorbernite on mindat.org. Haiweeite 8 photos of Phosphuranylite associated with Haiweeite on mindat.org. Studtite 6 photos of Phosphuranylite associated with Studtite on mindat.org. Torbernite 6 photos of Phosphuranylite associated with Torbernite on mindat.org. Meta-autunite 5 photos of Phosphuranylite associated with Meta-autunite on mindat.org. Autunite 5 photos of Phosphuranylite associated with Autunite on mindat.org. Uranopilite 4 photos of Phosphuranylite associated with Uranopilite on mindat.org. Uranophane 3 photos of Phosphuranylite associated with Uranophane on mindat.org. 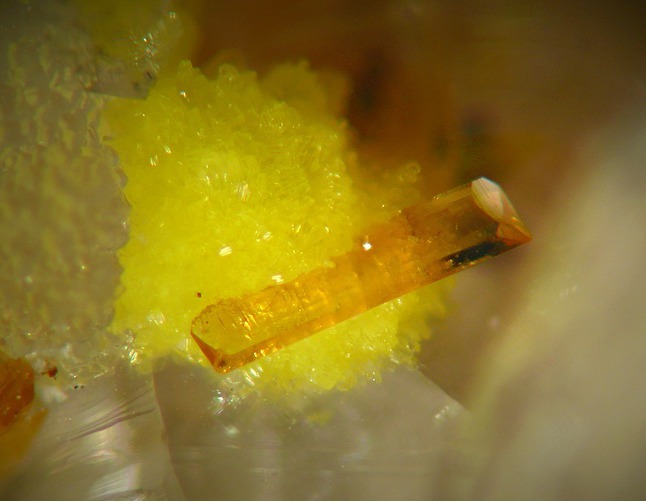 Wulfenite 3 photos of Phosphuranylite associated with Wulfenite on mindat.org. Uraninite 3 photos of Phosphuranylite associated with Uraninite on mindat.org. 8.EC.05 Françoisite-(Nd) (Nd,Ce,Sm)(UO2)3(PO4)2O(OH) · 6H2O Mon. May fluoresce due to admixed autunite, etc. Genth (1879) American Chemical Journal: 1: 92. Frondel, C. (1950) Studies of uranium minerals (V): phosphuranylite. Frondel, C. (1958) Systematic mineralogy of uranium and thorium. U.S. Geological Survey Bull. 1064: 222–227. American Mineralogist (1991): 76: 307. Demartin, F., Diella, V., Donzelli, S., Gramaccioli, C.M., and Pilati, T. (1991) The importance of accurate crystal structure determination of uranium minerals. I. Phosphuranylite KCa(H3O)3(UO2)7(PO4)4O4·8H2O. Acta Crystallographica: B47: 439-446. American Mineralogist (1992): 77: 1119-1120. Coutinho, J. M. V. and Atencio, D. (2000): Phosphuranylite from Minas Gerais, Brazil and its identity with yiangjianite. M&M4, 4th Intern. Conf. on Mineralogy & Museums, Melbourne, December 4-7, 2000; Program and Abstract Volume, 35. Frost, R. L., J. Cejka, and G. Ayoko (2008): Raman spectroscopic study of the uranyl phosphate minerals phosphuranylite and yingjiangite. Journal of Raman Spectroscopy 39, 495-502. Plášil, J., Sejkora, J., Cejka, J., Škoda, R., Goliáš, V. (2009): Supergene mineralization of the Medvedín uranium deposit, Krkonoše Mountains, Czech Republic. Journal of Geosciences, 54, 15-56. C. T. Friz, F. Rodrigo y P. N. Stipanicic - Recursos y Posibilidades Uraníferas en Argentina. Session 2.11. P/405. Argentina. Raúl Jorge Tauber Larry; C. T Friz, F. Rodrigo y P. N. Stipanicic. Recursos y posibilidades uraníferas en Argentina. Session 2.11 P/405. Comisión Nacional de Energía Atómica. Argentina. Henry, D.A., Pogson, R.E. and Williams, P.A. 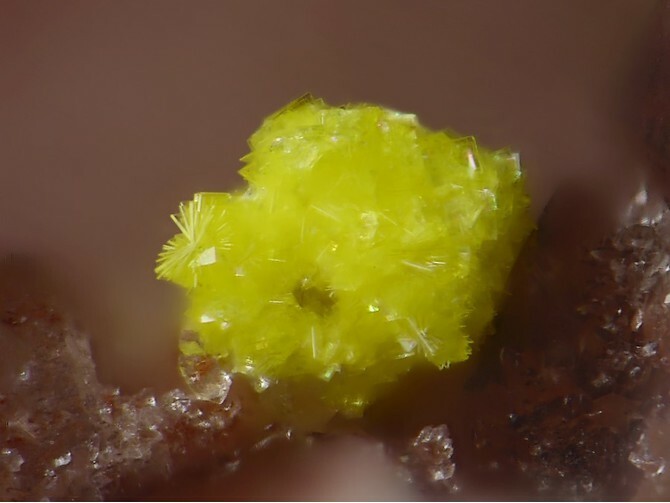 (2005) Threadgoldite from the South Alligator Valley uranium field, Northern Territory, Australia: second world occurrence. , Australian Journal of Mineralogy, 11, 7-11; Chipley, D., Polito, P. A., & Kyser, T. K. (2007). Measurement of U-Pb ages of uraninite and davidite by laser ablation-HR-ICP-MS. American Mineralogist, 92(11-12), 1925-1935.
ⓘ Knocker dyke (South Blue Jacket) ? Sejkora, Jiří; Čejka, Jiří (2007), Šreinite from Horní Halže, the Krušné hory Mountains, Czech Republic, a new mineral species, its comparison with asselbornite from Schneeberg, and new data for asselbornite. Neues Jahrbuch für Mineralogie - Abhandlungen, Volume 184(2)197-206. ; Sejkora, Jiří, Jiří Čejka, Vladimir Šrein (2007), Supergene uranium mineralization from Horní Halže, near Medenec (Krušné hory Mountains), Czech Republic. Journal of Geosciences 52, 199-210. Van Wambeke, L. (1971): The uranium-bearing mineral bolivarite: new data and a second occurrence. Mineralogical Magazine 38, 418-423.
ⓘ Chaméane Uranium Deposit ? Demartin, F., Diella, V., Donzelli, S., Gramaccioli, C.M., Pilati, T. (1991): The importance of accurate crystal structure determination of uranium minerals. I. Phosphuranylite KCa(H3O)(U6+O2)[(U6+O2)3(PO4)4O4·8H2O. Acta Crystallographica, B47, 439-446. Vignola, P., Zucali, M., Rotiroti, N., Marotta, G., Risplendente, A., Pavese, A., ... & Bertoldi, G. (2018). The Chrysoberyl-and Phosphate-Bearing Albite Pegmatite of Malga Garbella, Val Di Rabbi, Trento Province, Italy. The Canadian Mineralogist, 56(4), 411-424. LNEG / Siorminp database; Pinto, A. J., Gonçalves, M. A., Prazeres, C., Astilleros, J. M., & Batista, M. J. (2012). Mineral replacement reactions in naturally occurring hydrated uranyl phosphates from the Tarabau deposit: Examples in the Cu–Ba uranyl phosphate system. Chemical Geology, 312, 18-26. Anthony, J.W., et al (1995), Mineralogy of Arizona, 3rd.ed. : 328; Austin, S.R. (1964), Mineralogy of the Cameron area, Coconino Co., AZ, US Atomic Energy Comm. RME 99, Tech. Inf. Serv., Oak Ridge, TN: 99; Finch, W.I. (1967), Geology of the epigenetic uranium deposits in the United States, USGS PP 538. King & Foord, 1994. Mineralogy of Maine, Vol.1, p.265. King, V. and Foord, E., 1994, 2000, Mineralogy of Maine, volume 1 and 2, with updates by Van King. Clifford Frondel (1956) Mineral Composition of Gummite, American Mineralogist 41:539-568; Palache, C., Berman, H., & Frondel, C. (1951), The System of Mineralogy of James Dwight Dana and Edward Salisbury Dana, Yale University 1837-1892, Volume II: 876, 914.; Rocks & Minerals (2005) 80:242-261 New Hampshire Mineral Locality Index; Korzeb, Stanley L.; Foord, Eugene E. and Lichte, Frederick E. (1997): The chemical evolution and paragenesis of uranium minerals from the Ruggles and Palermo granitic pegmatites, New Hampshire, Canadian Mineralogist: 35: 135-144. Palache, C., Berman, H., & Frondel, C. (1951), The System of Mineralogy of James Dwight Dana and Edward Salisbury Dana, Yale University 1837-1892, Volume II: 876; Rocks & Minerals (2005): 80: 256.; Korzeb, Stanley L., Foord, Eugene E., and Lichte, Frederick E. (1997) The chemical evolution and paragenesis of uranium minerals from the Ruggles and Palermo granitic pegmatites, New Hampshire. Canadian Mineralogist, 35, 135-144. Palache, C., Berman, H., & Frondel, C. (1951), The System of Mineralogy of James Dwight Dana and Edward Salisbury Dana, Yale University 1837-1892, Volume II: 876; Januzzi (1976) Mineral Localities of CT and Southeastern New York State. Dana, E.S. (1892) System of Mineralogy, 6th. Edition, New York: 1078; Palache, C., Berman, H., & Frondel, C. (1951), The System of Mineralogy of James Dwight Dana and Edward Salisbury Dana, Yale University 1837-1892, Volume II: 876; European Journal of Mineralogy (1991): 3: 69; American Mineralogist (1991): 76, 1734-1735; American Mineralogist (1992): 77: 1119-1120. Reed, Juliet C. (1976), Annotated Biblio. of Minerals New to the Pennsylvania List 1965-1974, The Mineralogical Society of PA, Inc.: 63; Montgomery, Arthur (Jul, Aug, 1970), in PA Minerals (PM), PM (91) & (92), Keystone Newsletter. Reed, Juliet C. (1976), Annotated Biblio. of Mins. New to the PA List 1965-1974, The Mineralogical Soc. of PA, Inc.: 62-63; Montgomery, A. (May, 1970) in PA Mins. (PM), PM(890) Keystone Newsletter. http://rruff.geo.arizona.edu/doclib/hom/phosphuranylite.pdf; American Mineralogist (1984): 69: 380-382.